Premium Hearing Clinic | Can I swim with a hole in my eardrum? The importance of custom ear plugs. Swimming is a fun and active sport for the whole family to enjoy and stay healthy. However it comes with some risk when it comes to your ears. For the avid swimmer, one may develop what’s known as swimmers ears where as water enters the ear canal, overtime the ear compensates by producing bony growths in the canal to protect it from water borne infections. When a child or adult has middle ear infections and has a tube or a hole in their eardrum, the reality is that any water that enters the ear canal can go through the eardrum and cause further infections. Although it might be suggested that it is safe to swim with a hole in the eardrum, the reality is that most pools, lakes and oceans are contaminated and water getting through the eardrum can pose greater ear infections. For the individual with swimmer’s ear, having custom ear plugs which are made from silicone will repel any water from entering the ear canal to form a precise and comfortable seal in their ears. 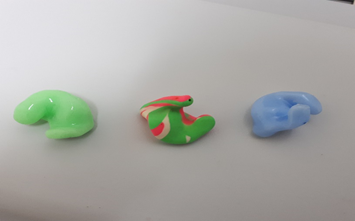 If you or your child have gone through having a surgery to put tubes in the ears to prevent further middle ear infections, then it makes sense to have customized made earplugs to protect the ears from any further infections and discomfort. The standard non-custom earplugs may only work temporarily but does not fit well and tend to fall out of the ears. They are disposable and create more of an environmental wastage. In addition these earplugs do not properly seal the ear and are based on average ear sizes where the rule “one size fits all” does not apply here. At Premium Hearing Clinic, having custom made swimming earplugs that are moulded to accurately fit each individual’s ear will help to form an exact seal against water entry into the ear canal. The custom plugs are soft and comfortable when seating in the ear canal, are easy to fit and remove and the best part is that they will protect the ears from any infections that can be caused from water activities. They come in many different colours for you to choose from: green, orange, purple, blue, yellow, pink, red, and more. So enjoy your swimming no matter the season but consider investing in custom earplugs and protecting your ears for infections. We also do custom plugs for noise, sleep and musicians. We are always happy to share our professional knowledge and advice with you. Please feel free to call Premium Hearing Clinic: 905-563-0011.